* Note: Federal law prohibits the use of this container for the storage of fuel. This metal jerry can by VALPRO is built to European military-spec design and provides a durable and preferred way to store and transport non-potable water. Atlantic British offers a range of jerry cans - different sizes, colors and materials to choose from. View all our Jerry Cans. 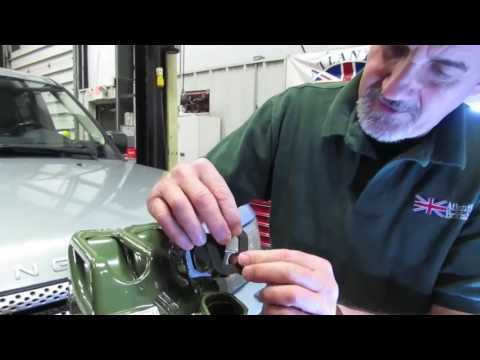 Watch Doug, our Land Rover Master Technician, remove the old seal and re-install a new Jerry Can seal on our NATO-Style Jerry Cans. Questions about this video? Call us at 1-800-533-2210 or contact us at https://www.roverparts.com. Well made cans with good solid seals that don't leak. one and only complaint so far: The cans were painted inside, shut and shipped without curing the paint. I just received and started using them a week ago - may update this review after 6 months. This is the 3rd Jerry can I've purchased so far. With the high humidity values here in S. Florida moisture getting into your fuel is always a big concern. These Jerry cans are made of steel and have a rubber gasket that seals very well. There's just nothing not to like about these fuel cans and I would highly recommend them to anyone who needs to store fuel on a regular basis. The real deal...not a knock off. Wavian, great for that "non potable water "
These are awesome. I bought 4 of them when Sandy hit NY and got them three days later when everyone locally was sold out of the crap plastic cans with horrible spouts. These cans have been sturdy and solid, never leaked once, and no rust at all. Two thumbs up! I ordered a set of four came in great condition and excellent packaging. It was so impressive I ordered 3 additional cans and fixed nozzel. I would recommend these to others.